Instead of starting from scratch each time a new site is being built, simply copy one of the pre-built templates from the template-library in RAI to the new site. A template is built just like a normal site, but has NO subscription. Each template in the library should be pre-configured and designed to match specific needs of the customers you want to approach. In RAI, there are two kinds of templates: GLOBAL and LOCAL. Both types are found under the templates tab. 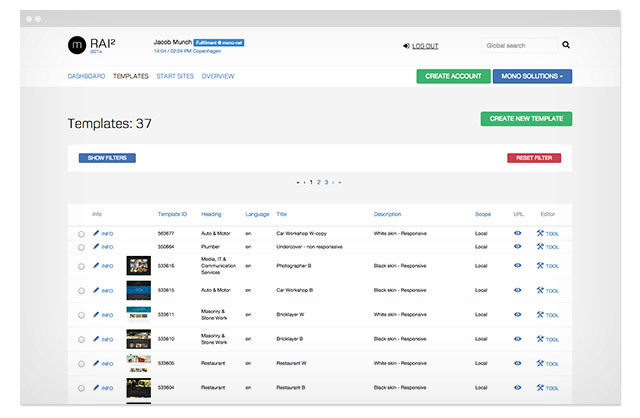 A GLOBAL start site/template is a template that is built by mono and pushed out to all reseller accounts in RAI. The global templates may NOT be edited by anyone else but mono solutions – but it´s possible to make a copy and then edit the copy in your LOCAL template library. A LOCAL start site/template is a template that is built by the reseller – either from scratch or based on a copy of a global mono start site/template. Navigate to the template tab to see the template library. When a radio button next to a template is checked, you can either delete or copy the template. Only ADMIN roles may delete templates. Global templates cannot be deleted. The process of building templates ought to be carefully coordinated with the go-to-market strategy. The template library should be built up in correspondence with the business segments in focus. RAI-users with the fulfillment permission has access to build templates. The best templates are built by people with design skills as well as an understanding of market and best practices for different business categories. Choose the language used on the template from the drop down list. Add a thorough description to the template. See best practice example left. Applying global data to your template, ensures that customer specific data can be automatically filled into all the correct modules when creating a site from the template. Read more about global data in chapter 6 above. There are 3 ways to apply a template to a site. It is possible to apply a template to an existing site at any time. However this process will overwrite all existing content, except for the content defined in global data. Applying the template is done from the ACCOUNT PAGE. 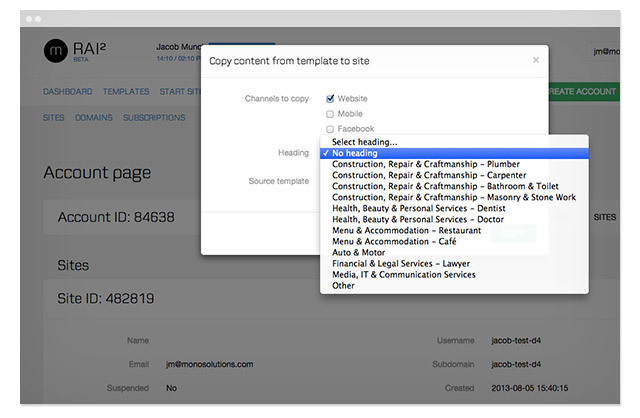 Click the [COPY] button to overwrite the existing site design/content on the chosen channels. Press the [CLOSE] button to cancel the process. Once a template has been copied to a site, ALL existing content and design on the site is overwritten with the template content and design. 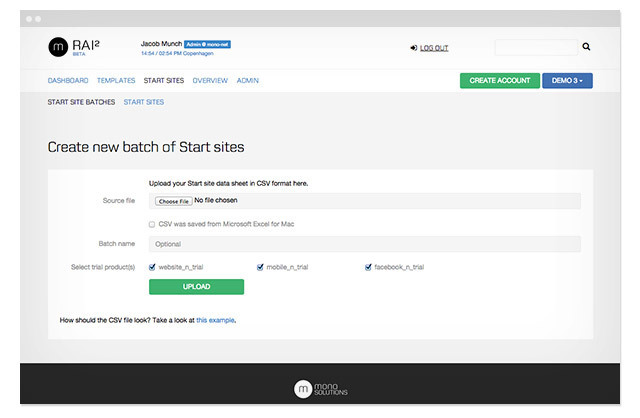 Automatically create up to 500 start sites at a time based on templates. 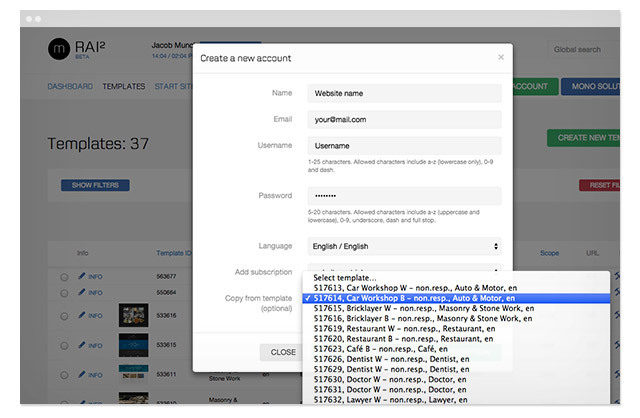 Data associated with global data tags can be automatically inserted in all the modules, where you want it to appear. Map specific template ID’s to global data that you want automatically inserted on your sites using the CSV file from the start site batches menu. Uploading batch data can only be done by users with ADMIN permission.